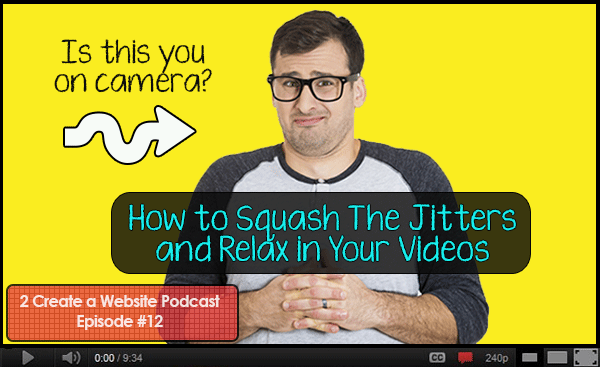 Are you avoiding video for your site because you aren’t comfortable in front of the camera? Whether it’s YouTube or creating courses to sell, video is HUGE. And if you aren’t using it, you could be missing out on a lot of traffic and income opportunities for your site. In today’s podcast I go over some strategies that will help you relax. Some of them may sound a little odd, but trust me… they work! Script or outline? Which one? Thanks for the great podcast. I have several videos on Youtube, and every time I taped a video, I had the jitters like I had to do a school presentation before the class! It’s so silly, because you are alone and no one is looking at you. Weird…any way thanks Lisa! Great episode Lisa! I could not agree with you more on the script. I find that I make more mistakes with a script sobI go off the cuff as well. I will try adding an outline though so that I will not miss key points. Eventually, I will attempt to get out of my comfort zone by getting in front of the camera. Since I do training videos, I tend to hide from being visible on camera. I’ve been in broadcasting a long time. You hit it out of the park here. That was an awesome podcast. Kudos! A major problem for most people is to stand up in front of the camera and record something. Many are shy, other are not confident enough. I think that video marketing is one of the best ways to reach targeted audience. Great tips 🙂 The advice about admitting to your audience that you’re a little nervous is similar to something I read in the classic “How to Win Friends and Influence People” book. I haven’t done much video but intend to once I have some half decent equipment. I’ll revisit this podcast from time to time when motivation is low! P.S. Following on about your technique of having an outline/ notes just below your camera… How about a smiling picture of someone you trust just above the camera? That could work? Hehe, it’s kind of funny thinking about attaching a pic of someone to the camera. I guess it could be a hero, expert, business leader, actor or television personality… as long as it provides a positive visual cue and motivation. This is pretty random but I’m imagining a photograph of Chuck Norris in “Walker, Texas Ranger” taped above the lens of a Panasonic AG-AC90AEJ. That would make me want to man up and finish the video! Haha. I don’t know what happens either (when you admit you’re not crazy about public speaking) but I guess it lowers your audience guard as soon as you say it. I recently spoke at an event with a few work colleagues and we all had different topics to talk about, I spoke last and I was seriously losing it due to my nerves. Everyone laughed and that actually gave me a lot of confidence to keep it going. Sergio, that’s too cool! I think making the audience laugh like that put you at ease and helped you relax. So that’s another good tip…. start with a joke! Thanks for commenting and sharing this on Twitter. Sergio, that’s a great tip, measured humour is very powerful and a great way to quickly build rapport with the audience. Thanks for sharing. Another great session! Of course, you are better off with videos because you have been doing it for a long time and there are many people following you. I do agree that this can be overwhelming if it is your first time… like dating…lol but once you have done it, it becomes much easier over time. People who feel “ashamed” or don’t even like to see themselves on the video have a “psychological” issue that they need to overcome. IMHO, they don’t love themselves enough yet! Good for you for overcoming the obstacle, William! Soon soon soon Lisa, I will be taking the plunge into video to help with my recipe creations. I’ve a strong Dublin accent, that’s my only fear but look forward to it. Great info hear as always you are a legend. On another note, have you noticed a massive change in your FB stats? In the last few weeks, most of my FB pages for my sites have moved near the front page of google and are constantly getting likes now where as before, not a peep for some. Very strange but not complaining. You may be surprised at how many people will actually like the accent! I’m sure you’ll be great. Good luck! No, no change in my FB stats that I’ve noticed, then again, I haven’t really been focusing much on FB as of late. Thanks Lisa, I really needed that. I have been pushing myself to do this, but I keep making excuses. something clicked when you said “It’s video, you can edit or do it again”. Also practice going over what you to say several and without a script. My problem is , the words don’t come out right and I sound like I’m nervous. So i’m going to try again and implement the tips you gave us. Your the best teacher on the web. Wow what a compliment! Thank you. please put a volume control on your podcast that is embedded on this page. I found you on YouTube and love you on it! we all love you the way you are REAL & I Love your Videos over podcast. Postcasts are like txt or email – too impersonal- we want to See your face! U R LOVED! Peace, love, prosperity, kindness, understanding, abundance & bliss to you! also I’m really into your $ money $ making & WP update web dev videos! Please focus more on WP web dev & $ Money $ making on the internet. affiliates, etcll.. that’s what made me find you 1st & I am so glad I did- Instant Karma 2 U! Don’t worry I won’t stop doing videos. But I had a camera issue that caused me to slow them down but I actually just recorded a video yesterday so stay tuned. Hope to have it uploaded by next week. I was surprised to see that you did a podcast. But I think its great. You have a nice voice. P.S. I also like your video. I don’t post video because I do not like how I look. What do u suggest? Better lighting, better camera, better background and/or better make up? Good lighting is a Godsend! It covers up flaws, gives you a more even tone and brightens everything up. I would start there. Do you have good lighting? Thanks for the informative podcast. You stated problems I have to overcome before making an audio/video of my work. You make it seem so easy… you’re a natural!